The other day I made my usual rounds through our local Sunday flea market. Sometimes I walk away empty handed (which is expected with slow decorating!). But every now and then, I leave with a little gem that makes all the empty handed visits worthwhile. This was one of those glorious days! YAY! 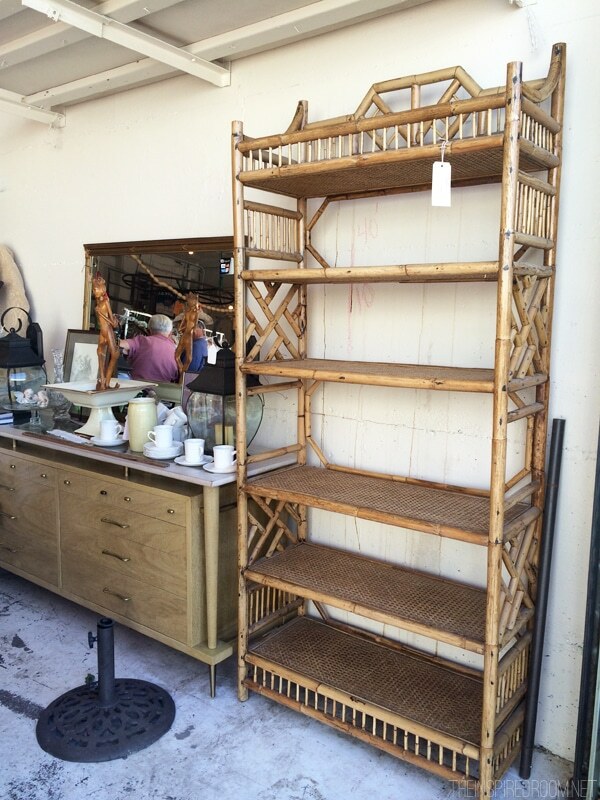 This time, I walked in the flea market and right there in the entry sat this amazing rattan shelving unit! It’s a sturdy, great quality piece about six and a half feet tall. I knew right away where it would go, it was perfect for my office! Twenty minutes later, I had the shelf home and sitting in my office. No shipping costs, no eight week wait. I love the instant gratification of finding a unique one of a kind piece for my home in a local shop. Contrary to the previous heavy bookcases I had in this room, I love how open and airy this is, without being too wimpy. It adds style, texture and personality, as well as being a really useful piece. One thing that really helps me when I’m looking around flea markets or second hand stores is to be both aware of my own style and what I might be able to use at my house, but also what’s available out in the retail world and at what price. That way I can recognize when I stumble upon a deal! I had seen a similar rattan bookshelf at one of my favorite online shops, Serena and Lily for $700 not including shipping. I paid $80 for my rattan shelf, so I’d say that was a great deal and the comparison helped me to feel confident with my purchase. Not only did I love it, but I knew it was worth the price. I tucked my new shelving unit here between my desk and the window. I LOVE IT! While I no longer need shelving for books in my office, it is perfect for displaying things like notebooks, magazines, odds and ends and my wire mail and filing baskets, not to mention a shelf for all the routers and internet contraptions that used to sit on the floor. You might remember the other second hand find in this room, the secretary and hutch that is on the opposite wall. I’m loving all the storage I have in my office now! A few of you have asked me where I find flea markets and what exactly they are. 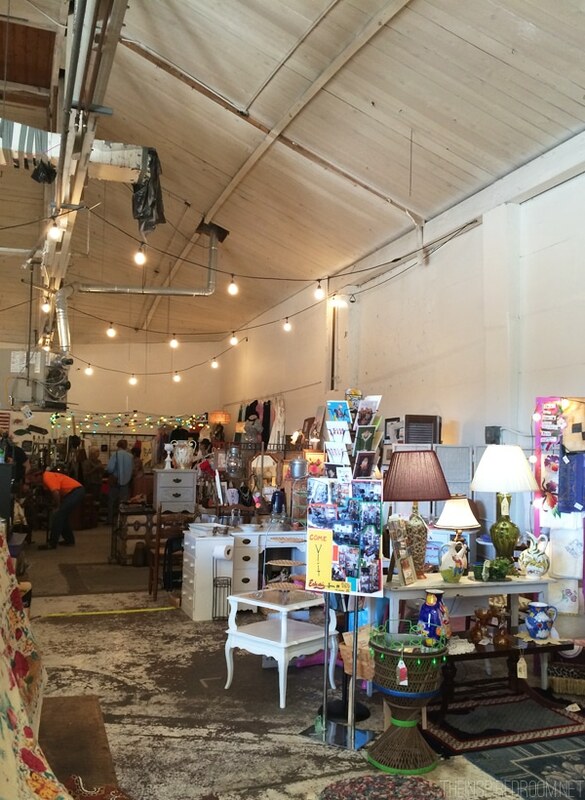 While I’m not a pro flea market shopper, we are fortunate enough to have a local flea market that is held in a warehouse next to a great vintage store in our area called Uptown Mercantile & Marketplace. 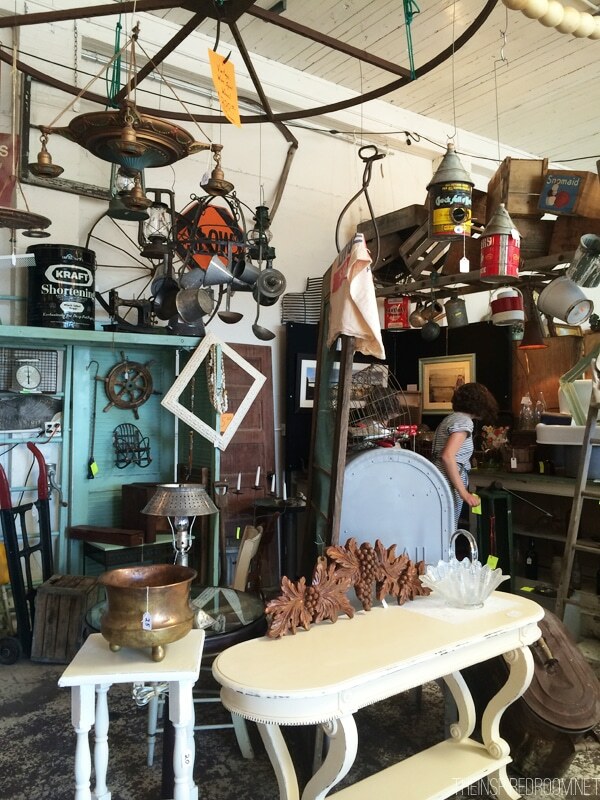 On Sunday afternoons they open the warehouse to vendors who bring in vintage items to sell in their booths. 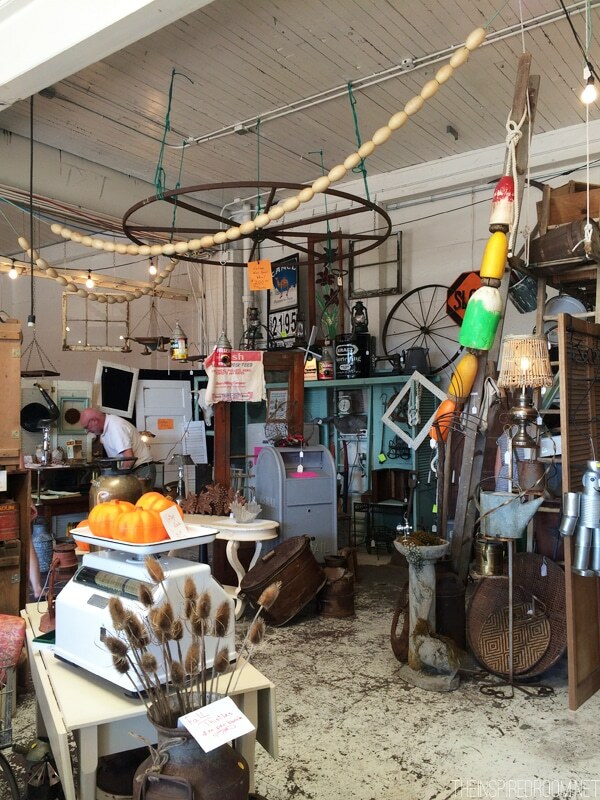 I’ve found quite a few things there, both in the store and at the Sunday flea market. Things like my pretty green garden stool, the white dresser in my entry, an iron arbor (which I brought to my backyard, I’ll update on that soon!) and more (see the bottom of this post for links to my other great flea market finds!). For curious minds, this is what the Flea Market looks like from the outside, the warehouse is on the right. 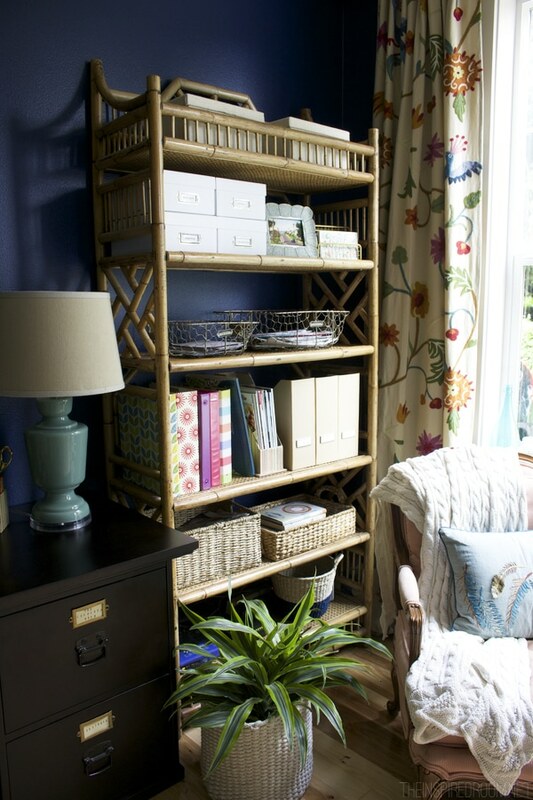 And here is what it looked like on the inside the day we bought the rattan shelving unit. While I don’t decorate my entire house with flea market finds, I do seem to have at least one second hand or flea market piece in most every room. I think mixing in second hand and vintage items to your decor is a secret to a unique style, since no one else will have the exact same things you do! What second hand deals have you found lately? 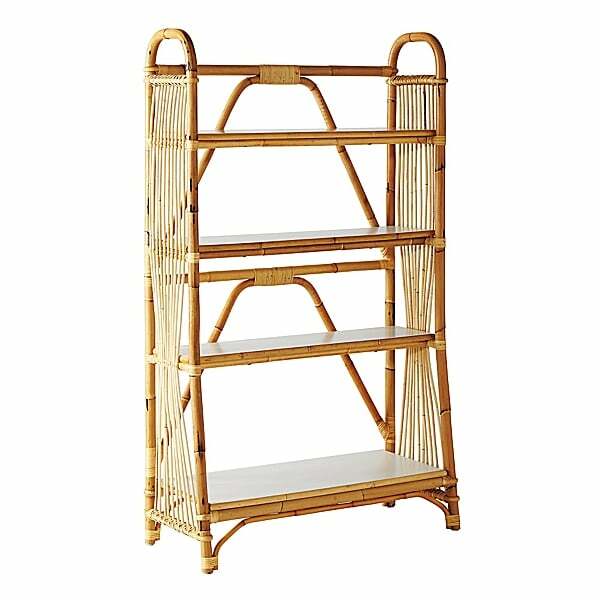 I recently found a foldable wicker shelf similar in size to your new shelf at a garage sale. I really liked it, but I wasn’t sure where it would go, but I really loved its personality. When the lady said she would take $10 instead of $15, that shelf folded itself up and jumped in my van! It fit perfectly between 2 windows in our bedroom and makes my sewing area look so much happier! (We have a very long bedroom-29 feet-so my sewing lives in there.) I love shelves and second-hand! Yay! That’s a great find :)! Where did you get those gorgeous curtains in your office? Are they embroidered or printed? I couldn’t tell, even with them being on the sunny window. And where is your flea market located? I see a bajillion things I could reinvent! Great find, Melissa! I love it when you find a piece you know is just perfect for your home. Wow! The detail on your find is so much better than the more expensive not a one of a kind find. Looks great! It looks great! I particularly like the protective railing around the top shelf. Oh wow, what a great find. I love this piece. So much detail and character. Looks so good!!!!!! We have lots of shops lije tjis in Savannah, one near me is a consignment shop, they gave cool things…..so I leave my money at home when I go in there , which hices me time to think thru a purchase…..its easy to fall in love with a piece, and not really be able to use it. My newest DIL (and my son) love that flea market! They have several treasures in their house. 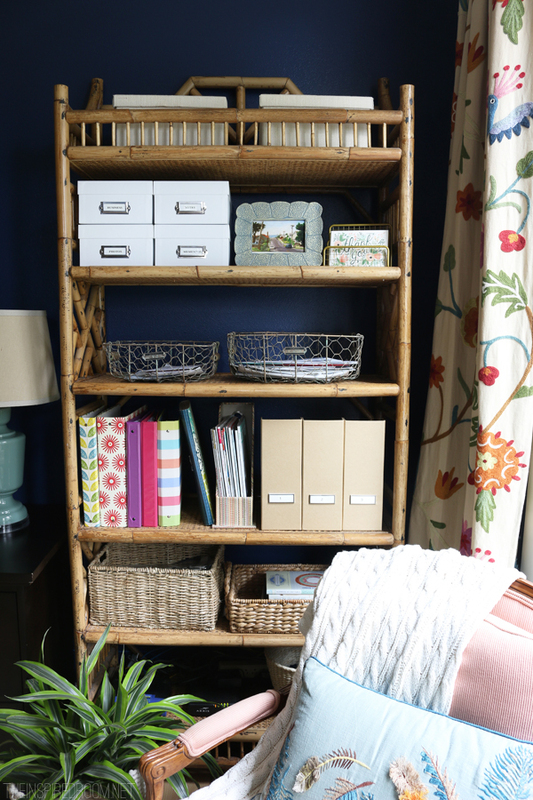 I’ve always loved my mom’s bamboo shelving that used to be in my grandma’s house – so I have lifetime memories of it. Wonderful find and your office must be very happy. I had similar great luck early this year at a consignment store near me – very small store but the lady is very savvy about what she takes in and about her potential customers. I’ve bought several items from her at deep discounts off her marked prices which are almost always up to 40% off anyway and we’ve become good friends. My find was a similar but wider heavy-duty creamy white metal/4-glass-shelf unit, perfect for the dark corner of my office where I needed storage up the walls but, like you, hated the thought of a confining bookcase. Two printers and other computer stuff fit on two shelves, one holds metal drawers and baskets for paperwork, etc. and the top shelf gets to be whatever. I love shopping this way, spotting a “something else” piece and getting that “aha – that would be a perfect ….” spark. Super fun and well done, Melissa. Love the shelves! Really like the curtains! Where did you find the fabric? Isn’t that beautiful! I love shopping at flea markets and vintage shops when I have the time. There are some lovely shops here in NE Tennessee that are such a blast to browse. There’s nothing more fun than finding a treasure for a bargain. Thanks for the post. I live in Allyn and will be checking it out this Sunday. They are open from 11-4 on Sundays in October right? I love rattan and shopping flea markets! But please tell me, where did you find the magazine holders that are on your lovely new bookshelf??? That shelf looks awesome in your office! Great find! Love the warmth it brings! I usually hit up one flea market, Goodwill, or vintage store per weekend too and my most recent splurge was 4 Harry Bertoia side chairs! I’d been stalking them on ebay and etsy for a while, so like you, I knew what they were selling for so when I found 4 and the dealer took less than the asking price I was sold! Cannot wait to finish my DIY kitchen remodel now! Woohoo for secondhand stores! Wow, way to go, that’s awesome! Congrats! Well, I have to admit I haven’t found any. BUT, I definitely love this shelving. Free standing shelving units are so versatile, and with just a bit of work, they can be filled with treasures to really make a room feel like “home.” The texture on this one is terrific!! Found a wonderful gray chair with nailhead trim at a garage sale. Found a black and white lampshade ( also at a garage sale across the street from my house) to go on my floor lamp which is next to that chair in den. Looks great! FYI: just got my November issue of Better, Homes & Gardens. Looked up your article and it was very informative. Love your before and after pictures of your kitchen. Begins on page 79. Thanks Judy — I can’t wait to see the BHG in the stores!! And wow, that’s great that you found a few fun things at garage sales! :-) I love when that happens. Great find, Melissa! Perfectly styled! After 5 years I still love my vintage suitcases that serve as a side table in my living room. I found them on the side of the road, ready for trash collection. Glad I got there before the truck did. Can’t beat that price! I am so going to this flea market next Sunday! It is every Sunday, right? That is a great find and a great price. I love that it’s such a good size and looks substantial and not flimsy. Score! Love it! I would love something like that for my office too. I need to add height for storage and all the office stuff and of course need style! Thanks for the inspiration. I love a great find, it’s kind of like mushrooming, you find some secret spot and wallah, treasures! Your bookcase looks perfect and is well decorated now, it has found new life! Enjoy the hunt, you never know what you might find that wants to come home with you. Great find! And are those Mary & Martha market baskets on your shelf? I loveeee them! wow that is a keeper! Great find! Love how it just fits right in! btw…I need a flea market near me like that ASAP! Thanks for sharing! This market is so close to my home and I have never been in. I will have to visit soon. Megan! You’ve never been there? Ahhh! We need a girls’ outing there then. Ha, it’s fun!